We want to thank our generous donors to Aurora’s Angels Fund, a fund in memory of our beloved former hospital cat. Helping cats in need in our community is something that is very important to us. These funds enable us to provide services for cats in our Montgomery County community who otherwise would not receive needed care. Dr. Mustillo and I, left to our own devices, want to save every cat. We obviously can’t do that, but we have a special soft spot for seniors (such as our current hospital cat, 19-year old Cleo) and especially kittens. 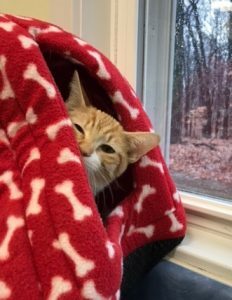 PJ is a 10-month old orange tabby, a very cute and sweet guy. He was growing normally and his kittenhood was fairly uneventful, although his dad noted that his stomach was always “gurgly”. PJ came in just before Christmas for an eye infection. But I was more concerned about PJ’s also losing 1 pound and having very rough coat, a sign of dehydration. Routine treatments – checking for parasites, repeat deworming, medication and diet change – still didn’t really help him. PJ then began vomiting and stopped eating. By the time Dr. Mustillo saw him on a Friday evening, it was clear PJ would be spending the weekend at the 24-hour referral hospital, on IV fluids and other supportive medications. We worried about a “foreign body” obstruction (basically, anything ingested that is not food blocking his intestines). However, an ultrasound exam showed this was not the case. Even the referral hospital couldn’t pinpoint exactly what was going on with PJ. Aurora’s Angels Fund donations to the rescue! By the time PJ went home, his dad was out of money to pay for any additional treatment, but none of us wanted to give up on PJ. Lab work and xrays did not show any additional problems, so the goal was intensive nursing care to see if PJ was strong enough to get better. We worked out that PJ would spend his days with us and his nights at home with his dad. Our wonderful technicians and assistants gave PJ subcutaneous fluids (SQ, or under his skin), hand-fed and medicated him several times daily until PJ started eating a bit of dry food on his own. He liked hanging out in our treatment room, where he would sit in his “hut” and watch out the window or the goings on in treatment. Dr M and I would say “I think he looks a bit better today”, not sure if that was true or wishful thinking. When PJ’s dad didn’t call for a while, we hoped that was a good sign but weren’t sure. Several days after he had stopped coming in daily for treatments, PJ came in for a recheck. He had gained a pound! When you go from 5 to 6 pounds, that’s significant. He even ate during his exam! His dad was continuing medications and a special diet, but had been able to stop SQ fluids since PJ was eating well. PJ wasn’t out of the woods yet. He has had some ups and downs since he was practically living here in early January, and he is continuing on a special diet and some medication. But, as he has continued to gain weight and do well at home, we are so hoping that this little guy will continue his progress! While we always want to know “why” when we have a sick kitty, especially such a young one, sometimes finances do get in the way. We may not have a definitive diagnosis on PJ, but thanks to your help with supportive care, watching him turn into an active, playful kitten is just so uplifting. How does my cat’s annual exam help cats like PJ? As we said, helping cats in need is something we all care deeply about. That is why A Cat Clinic donates a portion of your cat’s wellness exam fee (Annual, Senior or Semi-annual) to Aurora’s Angels Fund. So you can feel good about scheduling your cat’s check up for two reasons–it helps your cat stay in good health, as well as helping other cats in need in our area. But we couldn’t make it work without you. 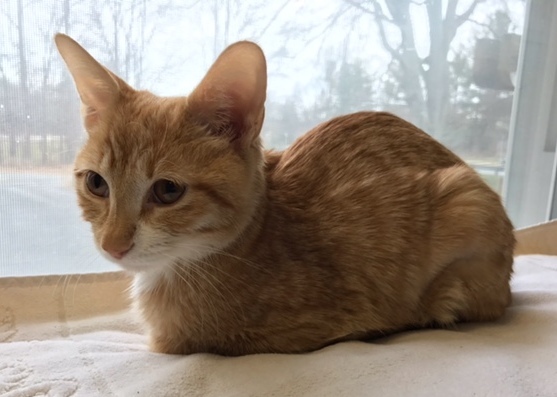 Thanks to our generous donors, we are able to help kittens like PJ in our Germantown community. We so appreciate you helping us help this sweet little kitten. PJ’s dad is beyond grateful; we’re just hoping PJ can look forward to a long happy, healthy, normal kitty life. We will keep you posted!